Whenever I get a new tarot deck the first thing I do is glance through the cards to get an overall impression of the deck, then shuffle and pick one. I do that before reading the book that comes with them or even the blurb on the back of the box. I trust my instincts to tell me whether a deck will work for me far more than what anyone else has to say about it. I instantly knew I'd be using my new deck of Angel Tarot Cards a lot. And that slightly surprised me. The Angel Tarot is the latest divination set by Doreen Virtue, with co-creator Radleigh Valentine. 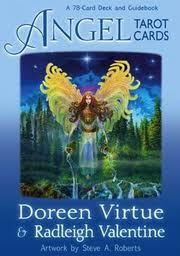 Doreen Virtue is best known as an angel expert. She is the author of numerous books and divination sets on mind-body-spirit themes, including Healing With The Angels and The Angel Therapy Handbook. I've enjoyed using some of Doreen Virtue's earlier divination decks - including reviewing her Archangel Raphael's Healing Oracle Cards for Magical Times- but generally found them a bit too light and fluffy for in-depth readings. I normally use a traditional tarot set that can show me the troubles that lie ahead rather than concentrating on the positive aspects of life - if there's a wasp in the room, I like to know where it is before it stings me. But there's an exception to every rule and, for me, that exception is the Angel Tarot. It manages to keep the full power of a traditional tarot deck but transforms potentially scary cards - such as the Devil or the Tower - into forms that are less frightening, but which lose none of their underlying meaning For example, the Devil becomes Ego in the Angel Tarot and represents being entrapped by unnecessary anxieties and attachment to material things; while the Tower becomes Life Experience and indicates a wake-up call that a situation can no longer be ignored. Frankly, these are the interpretations I have always given to these cards - renaming them makes their meaning clearer. Publisher Hay House says on its website: "Tarot has long been revered for giving detailed and accurate forecasts. Doreen Virtue and Radleigh Valentine have created the first deck of tarot cards that is 100 percent gentle, safe and trustworthy! All of the words in this deck, as well as the artwork by Steve A. Roberts, are positive and beautiful, while still retaining the magical effectiveness of traditional tarot." In the Angel Tarot, the Major Arcana are represented by one of the 15 principle archangels as well as mostly having recognisable tarot names such as the Magician and the Lovers. All the cards also have a single sentence description of what the card means. The minor arcana, instead of being called Coins, Swords, Wands and Cups, are named after the elements they represent - Earth, Air, Fire and Water. These are depicted with paintings of fairies for Earth, unicorns for Air, mermaids for Water and dragons for Fire. The artwork, by fantasy artist Steve A. Robert is gorgeous and really makes you want to use the deck if only to see the lovely images. But the main reason I know I'll be using this deck a lot in future, is the accuracy of that first reading I did for myself with the first card I drew from the pack. It was the 10 of Fire (pictured left) and it told me I am working too hard. I need to get a better work life balance. Spot on. And almost identical to the reading I got a month ago when I reviewed The Fool's Wisdom Oracle Cards. Time to book a holiday, I think, but I'll definitely be packing the Angel Tarot in my suitcase when I set off to relax on sunny shores. The Angel Tarot Cards boxed set was published this month by Hay House and can also be ordered through Amazon. I am studying about tarot reading in my free time and it is really interested subject but some time it will be like unnatural.. I wonder if online tarot readings are as good as face to face ones? I am yet to find the answer to this one. My opinion is that face to face tarot readings are much better than impersonal ones over the internet. I have this deck, but to be honest I am not sure if I like it or not. The pictures are beautiful but at the same time I think they are far to fluffy bunny for me. And there is one thing that really annoys me when it comes to this tarotdeck and that is the fact that the description stands on the cards. I do not like that. Nah I guess I will hold on to my legacy of the devine, guilded tarot or witches tarot <3.